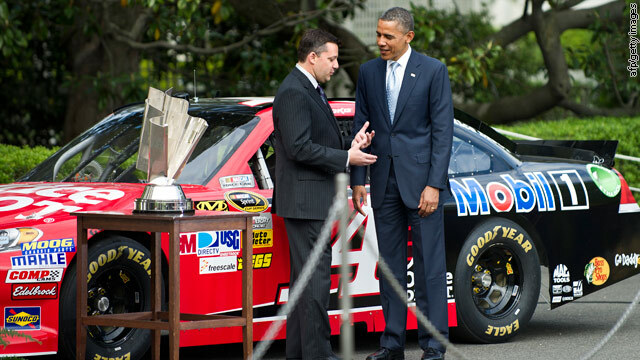 NASCAR driver Tony Stewart speaks with President Obama in front of his car on the South Lawn of the White House. Obama was joined by NASCAR drivers to honor Tony Stewart's Sprint Cup Series Championship. THE PRESIDENT: Thank you. Thank you so much, everybody. Please, please have a seat. Welcome to the White House. And congratulations to Tony Stewart on his third Sprint Cup Championship. You can give him a round of applause for that. It is great to have NASCAR back in Washington. I want to thank Brian France and Mike Helton for their leadership. We’ve got some members of Congress who are big racing fans who are here. We’ve got some of my staff who are big racing fans who are here. I also want to welcome the rest of the drivers who are with us - the best of the best right here. Thank you all for coming. We really appreciate it. Now, full disclosure: I invited Tony here today because of what he did on the track. But I was also hoping he would give me some tips on the media, because he's got that quiet, reserved personality - (laughter) - and I was figuring I'd stay out of trouble if Tony gave me some advice on that. A few years ago, Jimmie Johnson showed up and showed me how to start one of these cars up, explained how everything worked. It was impressive. But what was even more impressive is he got in and got out dressed like he is now, and he did not rip his suit - (laughter) - which took some skill. And I do want to acknowledge Jimmie because, even though his five-year streak is over, I think we can all acknowledge he is one of the all-time greats. And I know he is itching to take the title back. So congratulations, Jimmie, on everything that you've done. But this was Tony’s year. And "Smoke" gave us one of the most dramatic finishes that we have ever seen. After barely making the Chase, Tony took off, winning an amazing four races in the post-season. And then came the final race in Miami - a must-win. Tony went all out. Twice he came from back of the pack, passing 118 cars - sometimes three wide. Tony said it felt like he passed half the state of Florida. But in the end, he hung on to take the checkered flag and win the championship with a tie-breaker. I want to make special mention out of this outstanding group of Carl Edwards; he’s also a member of my Fitness Council. Carl battled Tony down to the wire and came about as close as you can get without actually winning. And congratulations on all your unbelievable success as well. And I think everybody who saw Carl after the race - it was a great lesson in how you handle disappointment with grace and with class, and he’s a outstanding representative for all of NASCAR. And that’s typical. Underneath the helmets, behind all the trash talking - and I notice it seems to be picking up quite a bit lately - these are some outstanding men. And it’s true about the whole NASCAR organization. One thing especially I want to thank NASCAR for is the support that you guys have provided to our men and women in uniform. You give active duty soldiers, wounded warriors, veterans all a VIP experience at races. And Michelle had a chance to see that firsthand at the Homestead race last year. You look out for military families. You look out for Gold Star families. You make regular visits to Walter Reed to raise spirits there. And for you guys to give that much back to folks who have given so much to us as a country and help protect us and keep us safe is remarkable. So I want to thank - I want to thank all of you for what you do on behalf of our troops. So congratulations again to Tony and his entire team. Thanks to everybody at NASCAR for what you do for our country. Thank you for not tearing up my grass - (laughter) - and best of luck in the season to come. Thank you very much, everybody. Give them a big round of applause. Romney is going to loose by a big margin in November. I feel really sorry for all the racist conservatives. If nothing else, Romney can become a Mormon priest and sing songs of greatness of white people. Turn the House and re-elect Obama 2012! So I guess your racist attitude isn't importantt? What a jerk. Next time you have a thought, let it go. You're putrid and sick. Get a life or a brain!!! It's his grass while he is there. It's whoever's grass that occupies the seat of POTUS. It will NEVER be your grass. Is that why you are so angry? Oh dear lord! Now conservatives will start hating NASCAR. Not that it makes a difference. it's a stupid competition anyways. You (O'IDIOT) invited Tony there for a photo pop...part of your campaign....you (O"Idiot) have no interest in NASCAR and we know it you phony! How do you know he hates NASCAR, bubble head? Or are you just spewing lies like the rest of the dingbats? he is a racist...nut boy...figure it out from there. Take it easy on the kool-aid. Yes, Obama knows NASCAR in depth, that's been demonstrated over and over over. - Curb your kool-aid intake pal. Who can approve their sanctioning this obvious photo-op ploy after all he has done to guarantee that NASCAR will either die or end up trying to race in battery/kool-aid operated cars? The limited vocabulary of the standard slur rhetoric of 0bama's followers demonstrated by DEcember 2012 reveals exactly their opinion of NASCAR fans when not being part of the useful idiot brigades. NASCAR and drivers need to hear in emails from fans that connecting their names with this administration is not recommended for the thriving future of NASCAR. BLAH BLAH BLAH. DON'T YOU HAVE A KKK CONVENTION TO ATTEND? They don't just let anyone in the new KKK. They require a partial brain that knows when to shut up. Womyn of 3 doesn't pass the criteria. OMG! The hatred in these posts is palpable! I feel sorry for you. Racist pigs!!!! Really? WTF is the problem? Presidents have congratulated the winners of national competitions of all kinds – and often invited them to the White House – for decades. Why is it that people have to find things to complain about regardless of the circumstances? It was a nice thing to do and perfectly in line with what he has done for other championships and with what other presidents have done. Find a more positive and productive use for your time and energy than trying so hard to make something good seem bad. TED NUGENT: "YOU MAY CONQUER OUR BASKETBALL COURTS, YOU MAY DOMINATE OUR GOLF COURSES, BUT YOU MAY NOT TOUCH OUR BELOVED NAAAAAASSCCCAAAARRRR!!!! C'MON BLACK PEOPLE, IT'S ALL WE GOT LEFT. Maybe you can help me out here. Since DC is dictating MPGs on our vehicles, shouldn't that apply to NASCAR? I wanna see some smart cars out there! SMART CARS ARE FOR SMART PEOPLE. NOT EXACTLY THE NASCAR CROWD. OUCH! (not a personnel ouch as I don't watch NASCAR , but rather a general ouch for those that do)! Lighten up a little My post about wanting to see smart cars in NASCAR was a little humor! I can't speak for DEcember (a DEM, btw) but I'm sure his/'her's was just a a little humor in response to my post! Nothing hate filled about it! I am a Stewart fan good or bad. We as Americans have to value everyones choices right or wrong it is what makes us america. Now as for the racist comments shut-up,nascar is not racist,some of the fans maybe,and that is their right. My family is made up of many different races. We all love nascar, we have never been treated bad by nascar events. Nascar has gone to great lenghts to make it save for all races. Maybe some othersports should look at nascar and learn some manners. I encourage all races give nascar a shot watch a race then form an opinion. Thank you. Classy guy. Pity the Obama haters who can't appreciate a Class Act. Nascar nation is confused right now. How dare one of their heroes go to the Whitehouse and take a picture with Obama. I wonder what sponsors will drop the nascar hero fearing retaliation. Nascar nation showed up out of respect for the office.., nothing else. try as you will barry sorento.... working class (NASCAR) folks know a phony when they see one...and you are a phony. Are you calling the president a Kia SUV? NASCAR is a waste of gas. I felt really good reading the article.....and then I got to the comments section. People need to let this rage go. How can you pull something negative out of the President congratulating the Sprint winner? This is not about politics..... Where was all the rage when W. was in office and sending Men and Women of to war and die on false information. Were is the rage at the financial industry that tanked our economy under W. Bush? Bah!!! !